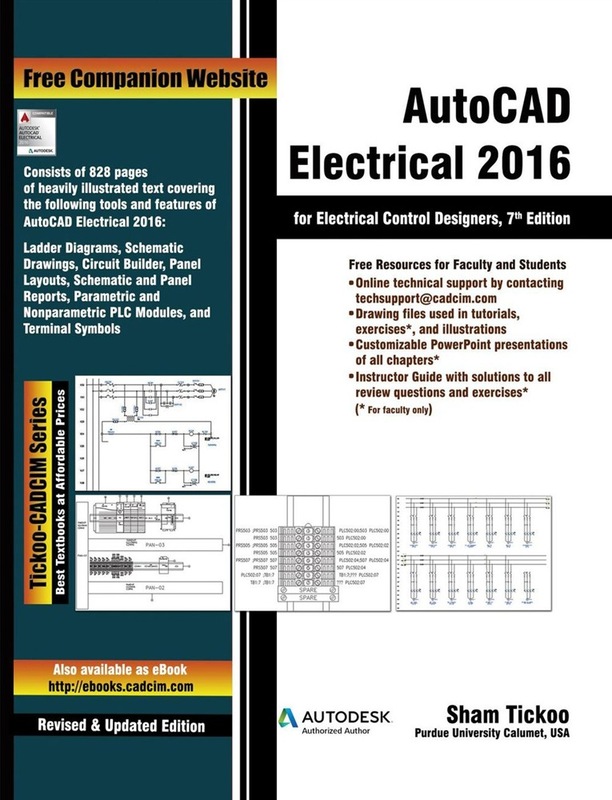 The AutoCAD Electrical 2016 for Electrical Control Designers textbook has been written to assist the engineering students and the practicing designers who are new to AutoCAD Electrical. Using this textbook, the readers can learn the application of basic tools required for creating professional electrical-control drawings with the help of AutoCAD Electrical. Keeping in view the varied requirements of the users, this textbook covers a wide range of tools and features such as schematic drawings, Circuit Builder, panel drawings, parametric and nonparametric PLC modules, stand-alone PLC I/O points, ladder diagrams, point-to-point wiring diagrams, report generation, creation of symbols, and so on. This will help the readers to create electrical drawings easily and effectively. The salient features of this textbook are as follows: • Tutorial Approach The author has adopted the tutorial point-of-view and the learn-by-doing theme in this textbook. This approach guides the users through the process of creating and managing electrical control drawings. Also, one chapter entirely based on tutorials has been added to enable the users to apply the skills learned in the text. In addition, there are about 26 exercises added in the textbook for the users to practice. Note that all tutorials and exercises in this textbook are based on the NFPA(US) standard. • Tips and Notes Additional information related to various topics is provided to the users in the form of tips and notes. • Learning Objectives The first page of every chapter summarizes the topics covered in that chapter. • Self-Evaluation Test, Review Questions, and Exercises Every chapter ends with a Self-Evaluation Test so that the users can assess their knowledge of each chapter. The answers to the Self-Evaluation Test are given at the end of the chapter. Also, the Review Questions and Exercises are given at the end of each chapter and they can be used by the Instructors as test questions and exercises. • Heavily Illustrated Text The text in this book is heavily illustrated with the help of around 900 line diagrams and screen captures. 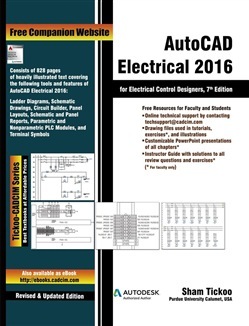 Acquista AutoCAD Electrical 2016 for Electrical Control Designers in Epub: dopo aver letto l’ebook AutoCAD Electrical 2016 for Electrical Control Designers di Prof Sham Tickoo ti invitiamo a lasciarci una Recensione qui sotto: sarà utile agli utenti che non abbiano ancora letto questo libro e che vogliano avere delle opinioni altrui. L’opinione su di un libro è molto soggettiva e per questo leggere eventuali recensioni negative non ci dovrà frenare dall’acquisto, anzi dovrà spingerci ad acquistare il libro in fretta per poter dire la nostra ed eventualmente smentire quanto commentato da altri, contribuendo ad arricchire più possibile i commenti e dare sempre più spunti di confronto al pubblico online.